Mamaroo: What’s the difference between the 2012 vs the current version (released in 2015)? Update June 2017: Mamaroo is coming out with a 2017 update shortly. Read what’s new in the 2017 Mamaroo here. This page covers the changes from 2012 to 2015. Reader Lauren W. writes in today with a simple question: what’s the difference between the 2012 and 2015 (which is the current version) Mamaroo? 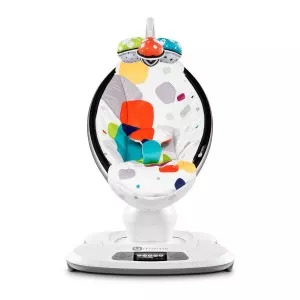 The big headline is the ability to control the Mamaroo’s motion and sound with a Bluetooth app (caveat: only certain iPhones/iPads and Samsung Galaxy phones/tablets are supported). On the 2012 model, you have to adjust the motion and sound from the LCD panel on the base. Speaking of the LCD panel, it is larger on the 2015 model—which you would think would make it easier to adjust settings. Part of the 2012’s versions success was the ability to change the settings by tapping your foot on the controls; or scrolling the volume or sound wheels. And if you think about this, that makes sense—when you are putting your baby down in the Mamaroo, using your foot to turn on the motion is quick and easy. And here’s one change in the 2015 that Mamaroo doesn’t billboard: the 2015 model has an auto shut-off feature after four hours. The 2012 version lacked this. Sounds like an improvement, right? Well, some parents curse the new shut-off feature, which inevitably turns off the Mamaroo (both motion and sound) right as baby has drifted off to sleep. So the jury is out on whether the auto shut-off is a good or bad idea. The overall size and footprint of the Mamaroo didn’t change in the 2015 model, even though the base is redesigned and looks sleeker. (One of the key reasons the Mamaroo is popular is the small space it takes up; the company claims this is half the size of traditional swings). Yes, the seat pad can still be machine washed (it is also reversible). There are a few other minor differences between the 2012 and 2015: the newer model has slightly larger toy balls for the mobile that hangs over baby’s head. Our take: if you don’t care about the Bluetooth app, then the 2012 version would be fine (you can still see it for sale online) and perhaps better overall. And oddly, the 2012 version is probably easier to control and use if you are app-less! FYI: The current Mamaroo is sold in two flavors—Classic (grey, black) and Plush (colored patterns). The Classic ($160 to $170) is a basic, canvas like fabric. The Plush ($229-$249) has a softer, more velvet like cover. We’ve evaluated the feel of both versions and think the Classic is fine. If you decide you’d like the more plush fabric later, you can buy an extra pad for $60. The official date is “July” so we assume soon! Hello! It sounds like I can safely purchase a current mamaroo swing cover to go on our older version mamaroo swing. Is that right? We misplaced our seat cover between babies. *face palm* Thanks so much! Good question! I don’t know the answer. I would touch base with 4Moms directly!